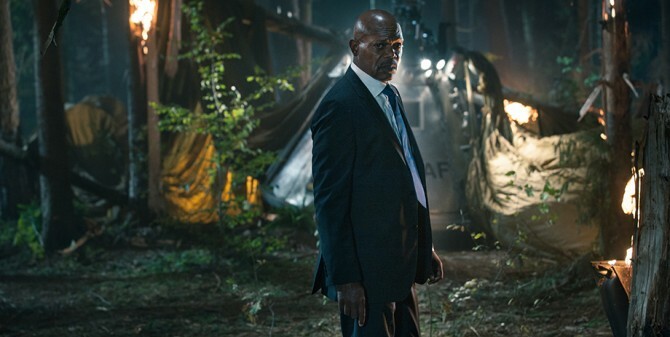 Across Samuel L. Jackson’s pantheon of movie appearances, the prestigious actor has starred in almost every kind and genre of film imaginable. For every Pulp Fiction, there’s Deep Blue Sea; for every Unbreakable, there’s Snakes on a Plane. Make no mistake, Jackson is celebrated for his diverse résumé, and the actor takes that a step further in Jalmari Helander’s Finnish blockbuster, Big Game. In a film that actively encourages you to suspend disbelief and leave expectations at the door, Jackson portrays the President of the United States who finds himself cast astray in the bitter-cold Finnish wilderness after Air Force One is taken down by a rogue group of terrorists. As a fish out of water, our protagonist is forced to partner up with a wise-beyond-his-years 13-year-old if he is to survive in the face of mother nature. Ray Stevenson, Victor Garber, Felicity Huffman, and Jim Broadbent complete the cast. And so, to celebrate Big Game‘s release on DVD and Blu-Ray, We Got This Covered has two Blu-Rays to giveaway. To be in with a chance of winning a copy of Big Game on Blu-Ray, simply enter using the widget below.